The recently published 2017/18 Annual Report is packed with information - including the Court’s caseload and operations statistics, judicial officers’ demographics, and descriptions of innovative initiatives. It even includes summaries of all the complaints about judicial officers examined during the year and their outcomes. This eNews summarizes some of the Report’s highlights. There was little change in the Court’s judicial complement (the number of judges) in 2017/18. While 11 judges were appointed and 2 senior judges were reappointed for one-year terms, 10 retired, 5 chose to sit part-time in in the Senior Judges’ Program, 1 was appointed to the BC Supreme Court and sadly Judge Randall Callan passed away in 2017. • There were 114 full-time judges, 27 senior judges and 1 judge sitting part-time (equating to 126.75 judicial full-time equivalents). • 46% of full-time judges were female while 54% were male (a higher percentage of Senior Judges were male). • Most judges were aged between 50 and 64, with an average and median age of 60. While active male judges continued to outnumber active female judges, of the 50 judges appointed in the previous 5 years, 27 were women. 7 women and 4 men were appointed in 2017/18. • 51 judicial case managers (full-time, part-time, or auxiliary basis). • 114,584 new adult and youth criminal, family, child protection and small claims cases heard by judges, down by 6% from the previous year. Adult criminal and child protection caseloads declined between 2016/17 and 2017/18 but are still higher than they were five years ago. Caseload volumes have declined in the other three areas of the Court’s responsibility over the past five years. The Fraser Region continued to have the highest new caseload, followed by Vancouver Island, Interior, Vancouver, Northern and OCJ Regions. Historically claims under $5,000 made up approximately 40% of all small claims files. On June 1, 2017 legislative amendments increased the Court’s civil jurisdiction to $35,000 and required that most claims for less than $5001 be taken to the online Civil Resolution Tribunal. New small claims cases were at their lowest point in the past five years in 2017/18. This decrease appeared to be related to the change in jurisdiction. The number of appearances by litigants without lawyers in 2017/18 was 126,721 – a 6% decrease from last year and the lowest number in five years. 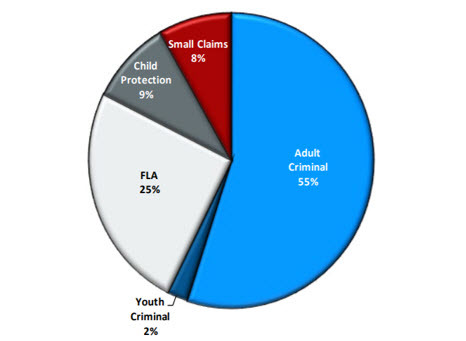 Self-representation rates were 18% for criminal matters, 41% for family, and 69% for small claims. The Office of the Chief Judge has developed operational standards - objective goals and performance targets the Court strives to meet with the judicial resources it has available. When standards are not met, the Office of the Chief Judge monitors trends, examines underlying causes and takes appropriate steps including reallocating available resources where possible. • The Court met its standard for pending cases, as it has for the last five years. • The Court met its completion rate standard within accepted margins. • On-time case processing of adult criminal cases remained below the Court’s standard. The Court measures “time to trial” from the date a request or order is made for a conference or trial, to the date when cases of that type can typically be scheduled. Average times to trial did not meet the Court’s standards. However, in both family and small claims cases, average time to a conference improved over last year. Average time to trial results held steady in both short adult criminal cases and youth criminal cases although it increased for longer adult criminal trials and for family and small claims trials. The number of family and criminal trials that did not proceed due to “lack of court time” (insufficient judicial resources to hear the trial that day) remained relatively steady at 3% and 5% respectively, but the number of small claims trials that did not proceed for that reason hit a five year high of 13%. In almost all areas of the province the Court is able to offer time for criminal trials well below the 18 month ceiling imposed by the Supreme Court of Canada in R. v. Jordan. Without additional judicial resources any increase in court time for criminal trials necessarily means delays in other areas of the Court’s jurisdiction. Given the importance of timely family and small claims trials, and child protection cases in particular, the Court did not allocate more court time to criminal trials as a response to the Jordan decision. However, the Court has reviewed its case management processes to ensure that court time is used effectively and judges are enabled to manage longer and more complex cases appropriately, and it continues to closely monitor time to trial and pending case data. As part of its ongoing efforts to improve access to justice, the Court adopted Support Person Guidelines in 2017 to make it clear that self-represented litigants in civil and family court trials are generally welcome to bring a support person to court to provide them with quiet help. The Court’s Chief Judge participated actively in the work of Access to Justice BC, a wide network of justice system stakeholders collectively committed to improving access to justice in family and civil matters. He and other representatives of the Court also attended two Justice Summits dealing with technology and justice in 2017. The Provincial Court also hosted a Media Workshop for journalists in the Okanagan Region and launched a new Media Guide, providing an overview of the Court, its role in the justice system, and its work. Other highlights of 2017/18 included the Court’s two education seminars. The first, on sexual assault trials, included an insightful presentation from Sheldon Kennedy. The second was held jointly with the B.C. Supreme Court and Court of Appeal and included sessions on gang-related crime. Another exciting initiative was the Court’s Criminal Law Committee’s development of a Criminal Law Boot Camp for newly appointed judges. The opening of the Nicola Valley and Prince George Indigenous Courts in 2017/18 brought the number of Indigenous sentencing courts in BC to 6. Discussions about the development of new Indigenous Courts are underway with several other communities including Williams Lake, Hazelton, Port Hardy and Port Alberni. A three-year pilot project, the Aboriginal Family Healing Court Conference (AFHCC) began operation in New Westminster. It is designed to reduce the over-representation of Aboriginal children in foster care by expanding Family Case Conferences into healing circles to support a more culturally appropriate process. On March 31, 2018 there were 51 participants in Vancouver’s Drug Treatment Court. During the fiscal year, the Court celebrated graduation of 13 participants who completed all four program phases. Now in its tenth year of operation, Vancouver’s Downtown Community Court (DCC) continued to provide on-site programs and classes to help prepare and connect sentenced clients for return to their communities. It also worked with local non-profit agencies offering low-barrier employment opportunities for clients. In 2017, clients completed over 1,000 hours of Community Work Service, most of it for local non-profit agencies. In 2017/2018, 128 people appeared in Victoria Integrated Court (VIC), up slightly from the previous year. They were supported and supervised in treatment and community service work by integrated teams comprised of police, social workers, health services and community corrections personnel. A variety of Domestic Violence Court projects continued in the Cowichan Valley, Thompson-Okanagan, and Surrey. • to connect the Justice Centre in Burnaby to remote locations for bail hearings. Using telephone and sophisticated video conferencing methods, the Court’s Justice Centre in Burnaby heard almost 22,000 bail hearings and processed almost 12,000 applications for search warrants and production orders this year. In 2017/18, the use of video technology also saved 34,731 prisoner transports, and the Court continued to expand its use by refreshing or adding equipment at various locations. From January 1 to December 31, 2017, the Office of the Chief Judge received 352 letters of complaint about a judge, judicial justice or judicial case manager. Of these, 335 were found not to be complaints within the authority of the Chief Judge – most of these amounted to appeals. Examinations were commenced in the remaining 17 matters. Including complaints carried over from 2016, 16 examinations were completed, 15 resolved at the examination stage, 1 resolved at the investigation stage, and 7 complaints had not been resolved by December 31, 2017.